The idea for Terra Ignota came to me years ago as I was admiring a reproduction of “Amerique Septentrionale,” a 1650 map by French cartographer Nicolas Sanson. The handlettering has a sort of rakish character, evocative of pirates or adventurers at a time of unbridled world exploration. I ended up putting the project aside, but the idea to create this font tugged gently at my mind until I simply couldn’t ignore it any longer. I’d originally intended to call it “Terra Incognita,” but during my dilly-dalliance another font turned up with that name, so Terra Ignota it is. It’s got an italic slant and a deliberate feel, in keeping with its historical roots. Useful for simulating old hand-lettered documents. 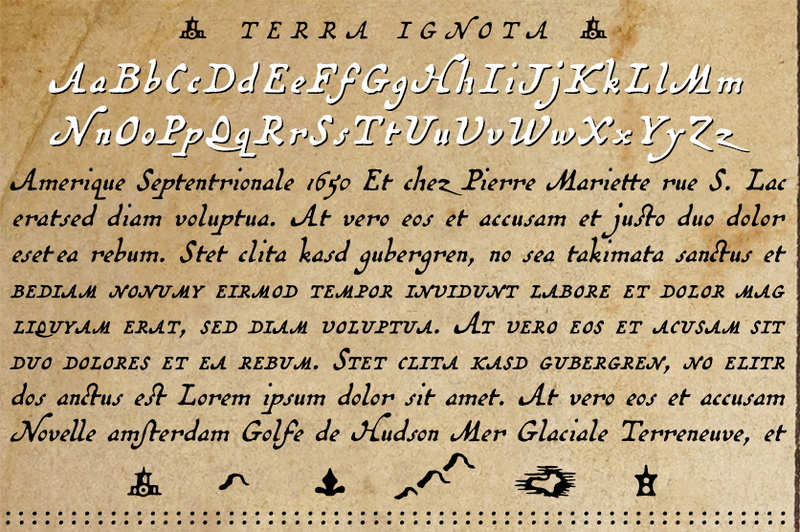 OpenType features include true small caps, numerous ligatures, Central/Eastern European and Greek alphabets, and a few cartographic ornaments. US$39.